Forget about Raindrops on Roses.... I think Sharpies and Chocolate are much more fun. 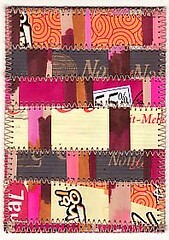 I sat down earlier this week to come up with a few ATCs to send to the Sharpie Scouts' Sweet Thangs swap. I was already running late because I had gotten myself overbooked in terms of projects AND Saturday was Spa Day at the winery (I won't go into it... suffice to say it was fun but extremely high maintenance). I figured I'd sketch a few chocolates (kisses, maybe? ), make them super colorful, and send them on their way. However, my hands had different ideas. I have this happen to me quite a lot. I sit down intending to do one thing and my hands make something completely different. I figure it's a collaborative project between my head and my hands. Intellectually, I gather the materials. Sometimes I end up with a finished piece that looks pretty similar to how I originally intended it. Sometimes it's completely different. This project ended up so different, really the only thing in common was the ATCs and the Sharpies. I sat down to sketch and didn't feel like sketching. Then I remembered all the chocolate wrappers I'd been saving to do a piece for Kate's charity auction project (it benefits Patient Services at the U of M Hospital where she works). She has an antique chocolate box that she's filling with pages of art. They can be autumn- or chocolate-related. I love autumn, but there's really no contest... Anyway, I'd been saving them to use on the chocolate page -- a patchwork border perhaps? This is getting to be quite a long story... sorry! So I grabbed the chocolate wrappers, chose a few and cut them into strips. Then I took all the Sharpies I have that remind me of chocolate and colored in a block of the colors. This I also cut into strips. I then wove them together, sewed them on the sewing machine, and cut into bite-sized ATC pieces.